You will need THE ARK (the ark cabin will take 160g of stuffing) - of Sirdar Supersoft Toddler Aran 100g balls: 2 in Mahogany 873, 1 in Walnut 868, 75g in Denim 870, and 5g in Minty 826; of Sirdar Bonus Aran with Wool 400g balls: 120g in Deep Red 830; of Sirdar Snuggly DK 50g balls: 10g in Oatmeal 344. 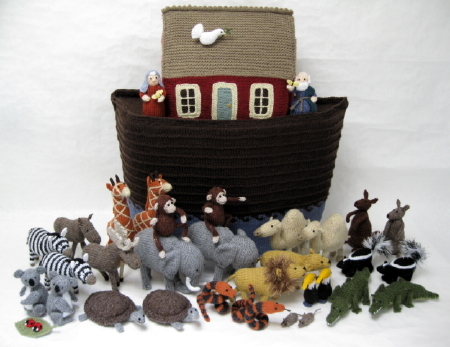 MR & MRS NOAH AND ANIMALS (each figure takes 5g-10g of yarn and 5g-10g of stuffing in total) - of Sirdar Country Style DK 100g balls: Oakleaf 608, Hazel 500, Greystone 408, Naturelle 409, Chocolate 530, Black 417, and Village Green 610; of Sirdar Snuggly DK 50g balls: Daisy 259, Stonewash 240, Indigo Mix 353, White 251, Brick Red 347, Summer Lime 260, and Denim Blue 326; of Sirdar Denim Tweed DK 50g balls: Vintage 644 and Aspen Blue 656; of Sirdar Bonus DK 100g balls: Alpine 842, Flesh Tone 963, Copper 843, Primrose 957, Sunflower 978, and Signal Red 977; of Sirdar Snuggly Snowflake DK 25g balls: Milky 630; of Sirdar Funky Fur 50g balls: Walnut 549, Jet Black 510, and White 512; a scrap of pink DK yarn. You will also need: Pair each of 3mm (no.11) and 4mm (no.8) knitting needles; a 9mm (no.00) knitting needle; two stitch holders; washable toy stuffing; 22cm (9in) brown nylon zip; 40cm (16in) of brown Velcro fastening; brown sewing thread; sheet of stiff card; bendy plastic drinking straws; a thin, drinks carton, plastic drinking straw; 30cm (12in) long pipe cleaners; clear adhesive; double-sided sticky tape; long tweezers; scraps of black, white, light brown, dark brown, dark grey, pink, and turquoise felt; hole punch; red, orange and brown coloured pencils; ruler; pair of compasses; hair spray.